I used the Martha Stewart Score Board Envelope Template to make this envelope. The paper was from the back side of the card paper. At Christmas time, Jon told me I needed to make some masculine cards for our grandsons who are 29 and 23. So, I decided I needed to do that for their Valentine cards. I find masculine cards so much harder to make that pretty feminine cards. Do you have the same trouble or is it just me? I started with a 6x6 cream card stock from Neenah Paper, cut out another 6x6 sheet from the La Romantique Graphic 45 paper pad, added a piece of black silk ribbon at a diagonal line and punched 4 gold butterflies for added interest. 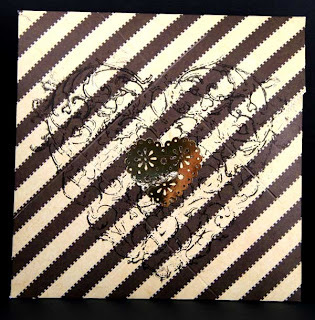 Then I use the Spellbinders Heart Nesties to cut and emboss the large gold heart from Marco gold paper. 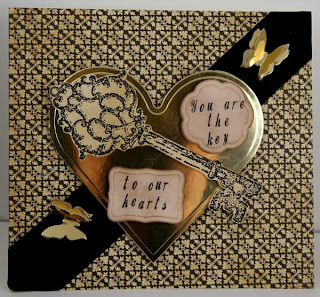 I just loved the key from the new Tattered Angel Stamps shown below, so I stamped it with Versa Fine Black ink. After it dried, I cut it out and distressed it to give it a more Vintage look. I used Trompe Upper and Lower Case to make the words I wanted to use for the sentiments. Those were cut out and embossed with Labels 8 and Blossom Spellbinder dies. Everything was popped up using Therm-O-Web Dimensionals. Wow ... I missed this one too!! Awesome masculine creation inside & out! Fantastic!